Kingston Plantation is located on 145 acres of beautiful tropically landscaped land, complete with lakes, bike and walking trails. The Margate Tower is the premiere resort on Kingston, when you enter the double-door foyer, you know immediately this will be a vacation to remember! 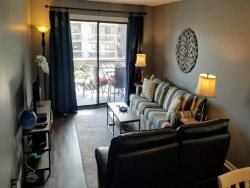 The unit itself also has a double-door entry, 9' ceilings, large balcony, washer and dryer, televisions in each room, oversized bathrooms, granite, stainless steel appliances and much more! There are actually two Master Suites with direct views of the ocean, a king bed in one and two full-size beds in the other. There is a queen bed in the third bedroom and the couch in a sleeper-sofa. Relax and dine in comfort in the gourmet kitchen complete with dishes and glasses for the entire family. There is absolutely no smoking and pets are not allowed.